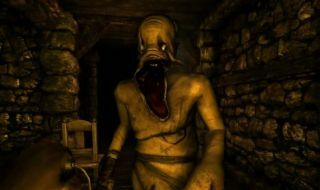 Frictional Games has announced that Amnesia: The Dark Descent will be getting a "hard mode" on September 28. In a move that's a huge contrast to the Safe Mode, introduced to Frictional's SOMA, a couple of years ago, Amnesia will now be even more challenging. According to Frictional, the new beefed up difficulty will make it "a little harder to beat the game." The changes from the original difficulty mean autosaves will be disabled, manual saving will cost four tinderboxes, losing all sanity will result in death, and oil and tinderboxes will be more hard to come by. And if that's not enough to get you crying into your keyboard, monsters will be able to locate you more easily, they'll be faster when they do, and are likely to make shorter work of you as their damage has also been increased. They'll stick around for longer too, presumably to bask in your misery and/or death. Yikes. Completing the game on Hard mode will net you a sparkly, new trophy, aptly called 'Masochist'. You'll be able to choose between 'normal' and 'hard' mode when starting a new game but will be unable to switch part-way through, so choose carefully.